How often do the largest patent firms appeal? We recently reported on eight reasons to consider filing an appeal during the course of patent prosecution. Based on the current relatively low number of appeals across all applications, we suggested that some law firms may be underutilizing the appeal procedure in their practices. Now, we report the differences among the three most active patent firms. Our methods are explained in more detail at the end. The top firms are 1) Finnegan, Henderson, Farabow, Garrett & Dunner LLP ; 2) Fish & Richardson PC; and 3) Knobbe Martens, which came from a recently published blog post on PatentlyO on the biggest firms according to total registered patent attorneys/agents. The Patentlyo blog post put Finnegan in the lead, with Fish second, and Knobbe close behind. This doesn’t mean that these firms have the most amount of patent prosecution work, but it at least puts us in the ballpark. We report here that these three firms have far different numbers of ex parte PTAB appeals. From July 25, 2016 to February 22, 2018, Fish & Richardson had 143 appeals. Finnegan was second with 78 appeals. And Knobbe was third with 60 appeals. While Fish and Knobbe had roughly the same number of patent applications (60,916 and 58,170, respectively) across all customer numbers searched, Fish had more than double the appeals. Even Finnegan, which totaled a third fewer applications (41,194) than Knobbe, had more appeals than Knobbe. The disparate number of appeals across these firms stems from a confluence of factors. One factor relates to the law firm itself. That is, a law firm may over- or under-sell the benefits of an appeal. Some practitioners get comfortable at preparing Amendment office action responses because it is the most common. Knowingly or not, psychological biases could influence the response strategy that a practitioner chooses or recommends to pursue. A practitioner whose recent sucessful strategy in one case might let this success influence strategy in an unrelated case simply because the strategy is more recent. Plus, projects that have fixed or capped fees favor efficiency and practitioners may opt for work that they are efficient at doing. These biases can be reinforced by billable hour incentives because prosecution can always be continued with an RCE. Finally, to law firms’ defense, before now there hasn’t been a way to quantify the chances of succeeding on the merits of an appeal. A wealth of experience can put someone in the general vicinity, but even then is incomplete. So part of the reason why firm appeal rates differ is law firm-specific. Another factor for law firms pursuing appeals at much different levels relates to the client. Some clients simply care less about the quality of patents. To them, numbers are more important. So despite the appeal procedure having several advantages for getting a good patent, it may not be necessary for some clients’ goals. An allowed application, even with narrow unusable claims, may be good enough. That clients drive appeals is perhaps best shown in the unequal distribution of appeals across customer numbers within a given firm. Pockets of appeals may show up disproportionately high for one customer number and low for others, suggesting that the decision to file an appeal largely depends on the client. Some clients may not like the concept of appealing. And as every lawyer knows, even excellent advice can only go so far, after which the client makes the call. Further still, different firms have different clientele, and some clients have more patentable subject matter than others. Often times, appeals are pursued only after options with examiners have been exhausted. So if firms operate under this paradigm (which is not being suggested that these three firms do), the clients with the less patentable subject matter might appeal more. But part of advocating includes not only accepting the client’s money, but providing realistic feedback on patentability. Another reason a client may shy away from an appeal may stem from a lack of trust with the practitioner. The upfront cost of appealing is not small change. And the client may interpret a strategy suggestion to appeal as a way to extract more money from the client, even with the best of intentions. Up until now, there has not been a good way to objectively convey the chances of succeeding on appeal and advancing prosection. But now, with Anticipat Practitioner Analytics, you can print out an unlimited number of professional reports that show how often the board overturns specific grounds of rejection relevant to a specific examiner. These include the specific points, called tags, and the legal authority, that the Board relied on in overturning similar rejections. For example, take a Section 101 rejection asserting abstract idea. You believe the examiner is wrong on step 1. 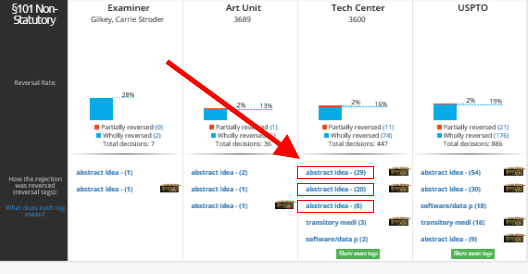 By looking at Anticipat, you can see where the Board has overturned abstract idea rejections based on step 1 for this examiner, art unit, or tech center. With this knowledge, you can feel more confident in advising appeal. So a data driven approach can greatly improve the advice and build trust on the strategy. Give Anticipat a try for a 14 day free trial. Our team is happy to provide a demo. We looked up customer numbers for the three firms using a publicly available dataset. We then analyzed customer numbers associated with the three firms, of which there were a lot. Finnegan has at least 55 customer numbers totaling 41,194 applications. Fish has at least over 100, totaling 60,916 applications. And Knobbe has at least 50 customer numbers, totaling 58,170. We then plugged in the customer numbers into Anticipat’s Research page and tallied up the total for the relevant window of time. In prosecuting a patent application, an appeal is not always the best option. But it also isn’t that bad an option. Currently, about 1-2% of applications go up for appeal. Based on the advantages that an appeal can provide, as well as the diminishing drawbacks, this low percentage of appeals means that many practitioners may be losing out. Here, we organize the eight advantages that appeals provide (either early in prosecution or late), as taken from previous blog posts. Are appeals underutilized? Perhaps. But some firms/companies are very strategic with appeals. They understand the value appeals give to their clients/themselves. More to come on that later. This is the first of a series of emails that showcases features of Anticipat so that you can get the most out of the products. Today, we review the daily recap emails. 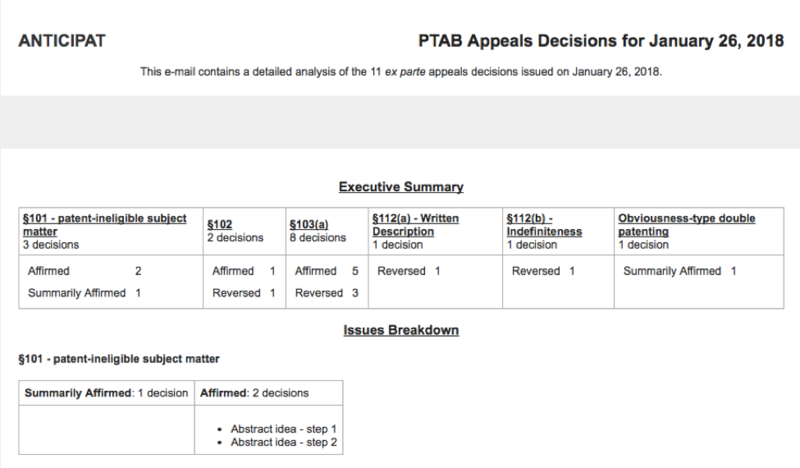 At Anticipat, we stay current on all newly decided ex parte PTAB appeals so you don’t have to. By default, we deliver subscribers a recap email of these decisions, after a few days for processing. In addition to seeing every ground of rejection at issue and every outcome decided for each case, you’ll also see the tags or the specific rationale the Board relied on in its outcome. See below image. As you can see, the recap email provides a comprehensive summary of all the grounds of rejection and outcomes for the day’s decisions. If receiving an email recap for each day’s ex parte appeals is information overload, you can customize your emails according to your personal preferences. Simply click on the profile link, and select the specific filters that are interesting to you and your practice. For example, say you are interested in decisions where the Board reversed a rejection Section 101 – patent-ineligible subject matter. By clicking “101 – Patent-Ineligible Subject Matter” under “Issues” and “Reversed” under “Outcomes”, you can be alerted via email only when decisions for that day include a reversed Section 101 rejetion. 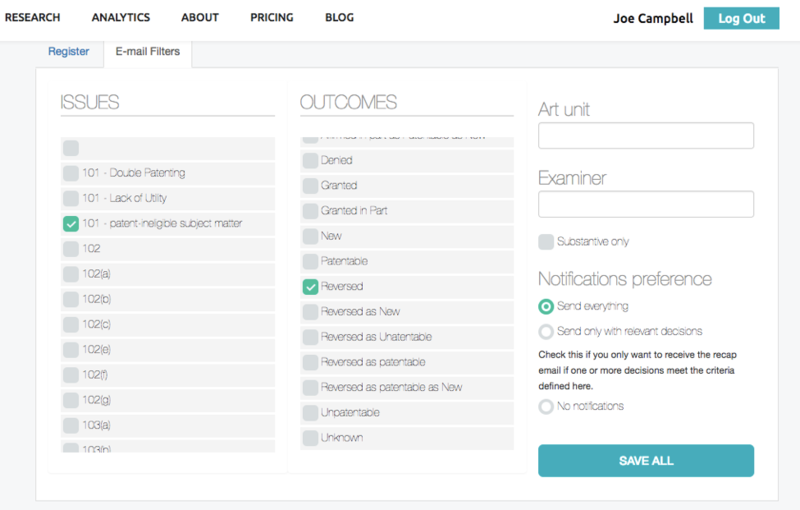 Other possible filters are for specific art units and examiners. This can come in handy as you are preparing a response for a specific Examiner to get alerted to a case where the Board decided the very same rejection you are faced with. If you do not want any notifications by email, simply select the radio button “No notifications”. We hope this has been helpful. If you would like for us to demo the product to a group, we are more than happy to do so. Click here to get started with a 14-day free trial. In filing a patent application at the USPTO, an applicant cannot choose its Examiner. Nor can it typically switch to a different Examiner once assigned. And since not all Examiners are equally agreeable or reasonable, being stuck with an Examiner sometimes puts the applicant at a serious disadvantage. Two different appeal conferences provide applications with another set of examiner eyes. Here, we show that these fresh sets of eyes can have meaningful impacts on prosecution despite any built-in biases. This can happen even before the appeal reaches the PTAB judges’ desk. The first procedure, pre-appeal brief request for review, is a relatively quick and inexpensive way to resolve “clear errors” in rejections. This brief is limited to 5 pages and is filed at the same time as filing a Notice of Appeal, with no extra fee for filing the request. A panel of three Examiners assesses the merits of the request for review, which guarantees that at least one examiner beyond the immediate examiner and his/her supervisor look at this application. One might suspect that pre-appeal conferences should be ineffective because two of the three examiners on the conference may already be predisposed against the applicant’s position. That is, the examiner who issued the most recent Office Action typically will not admit that his work product is faulty. Nor will the examiner’s supervisor, especially when the working examiner is junior and the supervising examiner has been involved in overseeing the Examiner’s work. So common wisdom would suggest that a third Examiner, even if on the same side as the appellant, would have a hard time winning over the other examiners. But these pre-appeal brief requests for review have significant effects on the state of prosecution of the application. One study showed that 6% result in a notice of allowance and 33% prosecution gets reopened (see www.ipwatchdog.com/2015/07/21/efficacy-pre-appeal-brief-conference-program/id=59937/). This means that almost 40% of the time the conference found that the Examiner’s Office Action was defective in some way. Next is the appeal conference. Here, similar to the pre-appeal request for review conference, three examiners meet to evaluate the application in light of the appeal brief. Interestingly, a study showed that 19% receive notices of allowance after appeal brief. And 21% of these cases have prosecution reopened with an Office Action. (see www.ipwatchdog.com/2016/03/21/ex-parte-appeals-quickallowances/id=67297/) This shows that 40% of the time, the appeal conference examiners did not feel comfortable sending this appeal to the Board. These data show that even before having patent judges at the PTAB give an application a fresh look, having other a pair of fresh eyes from examiners leads to meaningful results. The take home lesson is that having another pair of fresh eyes to evaluate an Examiner’s rejections is very important. Then, if necessary, the judges can also give the application a fresh look. That is, if it clears either of the 40% filters. Alice v. CLS Bank in citing Mayo made one point very clear: stating an abstract idea while adding the words ‘apply it’ is not enough for patent eligibility. This point may seem apparent to patent practitioners who hopefully are not literally reciting abstract ideas in claims and adding “apply it”. But a recent ex parte appeals decision highlights how a more common claim may fall into this same patent-ineligible category. wherein said steps (a)(l)(i), (a)(l)(v), (a)(l)(vi), (b)(l)(i), (b)(l)(v), (b)(l)(vi), and (c) are performed by execution, on a processor of a computer, of computer-readable instructions contained on a non-transitory computer readable medium. The Board was unconvinced of the appellant’s arguments and instead held that the claim was directed to gathering rules and remedies for each community and then displaying them to a sub-contractor. The fact that the claim recited the equivalent of “apply it” in the final element was no help to the patent-eligiblity of the claim. The Board instead found that the claim includes neither a technical problem nor a technical solution, but merely the application of an abstract idea on a computer via the Internet. Then the final blow: “We have repeatedly held that such invocations of computers and networks that are not even arguably inventive are insufficient to pass the test of an inventive concept in the application of an abstract idea.” Elec. Power Grp., LLC v. Alstom S.A., 830 F.3d 1350, 1355 (Fed. Cir. 2016). In conclusion, lengthy claims are not helped by merely reciting generic computer and network language. A final step with a wherein clause clarifying that previous steps are performed on a computer is perhaps a sign that the claim off course from patent-eligibility.